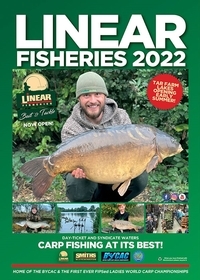 There are nine ticket waters at linear oxford and there is no limit to the time anglers can spend on them. These lakes, with the exception of the small pond adjacent to Hunts Corner Lake, can be fished throughout the day and night and for any period of time. 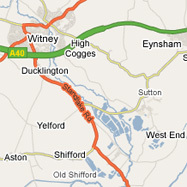 Hunts Corner Lake is open as an exclusive ticket water with limited swims. Hunts Corner Pond is a single rod water and open during the day only. 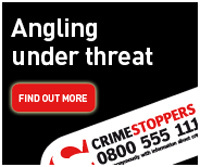 Tickets are available from the Linear Bailiffs who patrol all the waters regularly. It is permitted to start fishing and pay the bailiff when he visits your swim. Fishing on all these waters is open to everyone, all the year round. Except for Hunts Corner Lake and pond the permits are transferable allowing anglers to move between waters on the same ticket. There is a shower and toilet block situated between St. Johns and Manor Farm Lakes on the main Hardwick site where you can also obtain your drinking water. 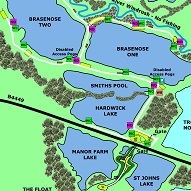 There are also toilets on all the lakes and in the Hardwick/Smiths car park, but no drinking water other than that at the shower block. Linear rules are sensible and can be found in the pages of this brochure, on our main notice boards and on our web-site. 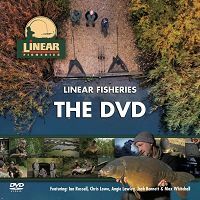 There is much within the pages of this site, our brochure and DVD that we hope will help you with your fishing on the Linear waters but in all ases the use of better quality baits in the boilie ranges will pay off every time and fished correctly will prove their worth. Particle type baits such as tiger nuts and maize/sweetcorn fished over a heavy spod mix have also accounted for a good number of carp; please remember though that all seed and nut baits should be prepared correctly. In recent years most good baits fished intelligently have been successful on all of our waters. Surface or mid water (zig rigs) fishing for carp anywhere on the complex should never be dismissed. This is a method that in the warmer months has accounted for many fish.